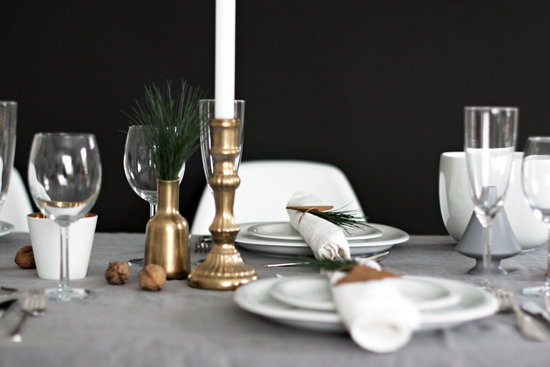 It´s time to sign off and to spend some time with my loved ones, but first I would like to show you some more pictures of my latest table setting as you might need a last minute inspiration before you are all set for guests. I stared out using my grey linen curtain as tablecloth. 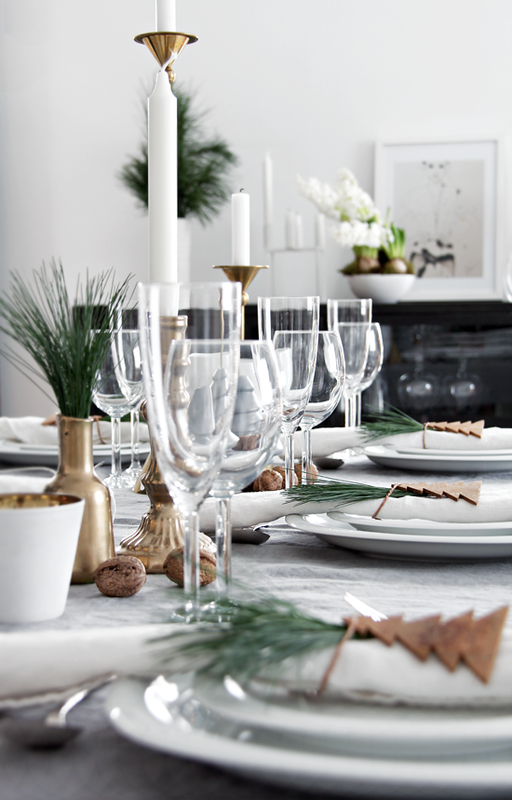 To make a dramatic look to the table, I´ve decorated with my gold (spray painted) vase and candle holder together with my brass candle holders from Fretex. It adds a bit of glam as well as it´s a nice contrast to the cold grey. Our tableware is called Suomi and are from Rosenthal. The cute cinnamon trees are from Home & Cottage. Wow…so pretty table setting! Thanks for sharing! Happy Christmas in advance! Ønsker deg fine dager sammen med dine. Jeg har unnet meg selv en bitteliten bloggrunde, før huset skal rengjøres og de aller siste innkjøpene skal gjøres. 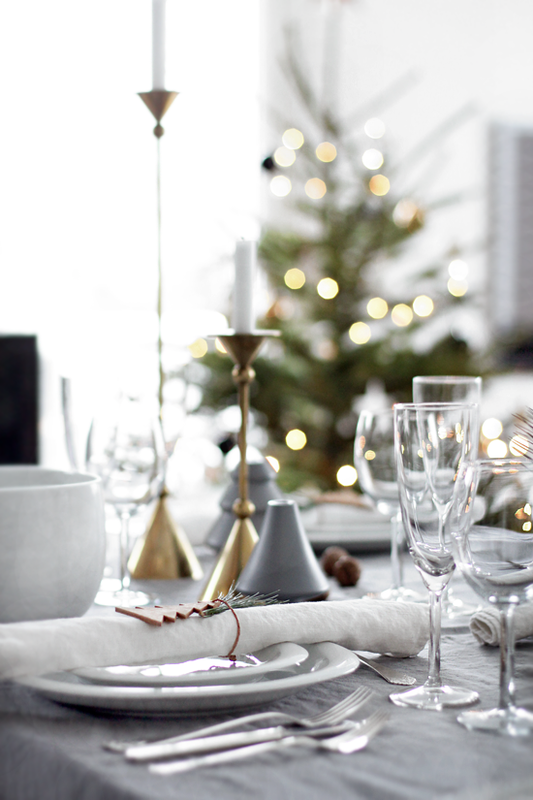 Ønsker deg og dine en riktig god jul, håper dere får en fin høytid! I love it! The linen curtain as a table linen is giving it a warm, cosy atmosphere. Very nice! Helt nydelig og delikat. Du er kjempeflink både med interiør/detaljer og med kameraet. it’s beautiful Nina, I have used some of your photo’s on my blog to inspire people! Thank you so much for all the inspiration this year and have a great X-Mas and a very happy new year! Vilken vacker dukning! Jättefint med guldet mot det gråa. Ha en fin jul med nära och kära nu! I´m wishing you and your family a lovely Christmas time and a wonderful, happy, healthy new Year! May all your dreams come true! 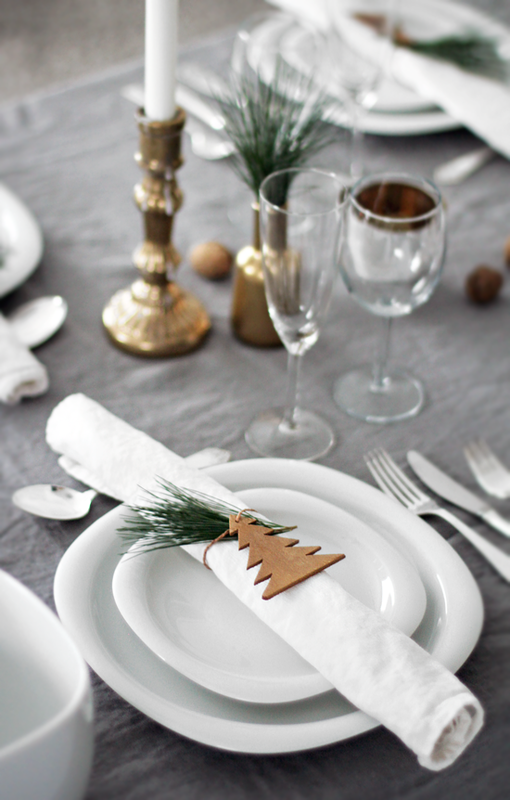 Your table setting is adorable and I´m always inspired by your wonderful decoration style! Thanks for sharing all this with us. Dear Nina, Merry Christmas, to you and your family. Happy, inspired, well designed new year. Best wishes! Lekkert bord! Drister meg til å anbefale bloggen min i dag! God jul! Ønsker deg en fin jul. I´m wishing you and your family merry Christmas! Nyyydelig pynta bord. Du er så flink!!! God Jul på dig! Hoppas att du har en riktigt skön julledighet. Bravo, this styling is truly amazing! I love the colors… it is truly a magic combination!